April 15th, 1989. A day that started like any other and would end with no one in the city of Liverpool being able to forget it. A day that would so thoroughly affect an entire city that its events still resonate to this day. One that is defined by one simple word. One that could invoke so much heartache, anger and pain. It used to be a town in South Yorkshire. A steel town. The home of Sheffield Wednesday and Sheffield United football clubs. Another mundane football stadium in another mundane football town—not anymore. Off to see Liverpool FC and Nottingham Forest contest a FA Cup Semi-Final match, those in stands and watching on TV would be faced with unspeakable tragedy. Ninety-Six fans weren’t coming home. Unbeknown to those that left their houses that morning; this day would radically alter their state of being for the rest of their lives. That is, if they were lucky enough to make it through. Men, women, children, fathers, mothers, daughters, sons. Ninety-six flames snuffed out. Over seven hundred injured. More than three hundred hospitalized–and for what? Police incompetence? Mistakes by the stewards? Disorganization? Delays on the roadway caused an influx of fans arriving late to the match. A scramble to get into the ground ensued before kick-off. An exit is opened to allow the fans in and avoid injuries at the turnstiles. More and more people were packed into the already overcrowded central pens with no one around to cut off the flow of bodies, no police, no stewards. No one knew what was going on. Those already inside were now pressed up against the security fences by the sheer weight of those entering behind them. There were screams, cries, pleas for help. Fans tried climbing the fences, Scrambling to get away. Oxygen draining, dying on their feet. The scenes from the Leppings Lane End should never have happened. No one should be faced with such tragedy. Not on a fun day out. Not at a sporting event. Not anywhere. Fearing a pitch invasion, the police standing by the railings were preventing people from getting out, pushing them back into the stand; doing nothing to help. By the time the referee had stopped the match, it was apparent that a large number of people were injured or worse. By this point, the fence had collapsed under the tremendous force of those pressed against it. Instead of assisting those in need, the police were now more concerned with creating a security barrier on the halfway line. With people dying in front of them, their main priority was to keep opposing fans from fighting. Fighting–at a time like this. Ripping down advertising boards to create makeshift stretchers, the fans attempted to help those in need. Even though many were not equipped with the necessary skills to make a true difference, they did everything they could. 44 ambulances arrived at the ground only be turned back by the police blockade. One solitary ambulance was allowed to assist. Only 14 of the 96 who lost their lives that day were admitted to a hospital. Those watching the match on television were faced with scenes of panic, confusion and utter chaos–a true sense of hopelessness. For those with relatives and friends in the stands that day, the grief would be too much, hoping beyond all hope that they would see their loved ones again. Following the disaster, what was reported in the papers continues to enrage to this day. Under a bold byline emblazoned with “The Truth” incendiary, erroneous accusations were leveled by The Sun and its editor Kelvin MacKenzie. Fans picking the pockets of the victims. Beating up health care workers who were administering CPR. All sources, all evidence, all fingers pointed back to the South Yorkshire Police and the lies they had perpetuated to cover their own grave mistakes. Dave Duckenfield, the Chief Superintendent in charge that day later admitted that he lied about the causes of the disaster. Not only the Sun, but many other papers ran this version of events. Ticket-less fans busting into the ground, killing their own. Uncontrollable yobs, hyped up and drink and fanaticism. Even today, more than 20 years on, there are those spreading misinformation and blatant lies. Steven Cohen, host of the Word Soccer Daily radio show, is one of the vilest offenders. Fabricating and perpetuating media lies from the 80’s, he has placed the blame solely on 6 to 8 thousand ticket-less fans who have been proved beyond a doubt never existed. Nothing could be farther from “The Truth”. In the wake of the tragedy, the city of Liverpool was united beyond tribal lines. Such trivial things as football rivalries meant nothing at a time like this. Former Liverpool player and then manager Kenny Dalglish sent representatives from the squad to each and every funeral, attending many himself. Anfield was opened up for the public to grieve. The story goes that the first commemoration to be laid on the Kop was a blue and white scarf of cross town adversaries Everton. There wasn’t a person in town that was not affected in some way by the tragic events of April 15th, 1989. They were all Liverpudlians after all. A number of organizations have been set up to educate and help the bereaved cope with their tragic losses. An inquiry into the causes of the disaster, The Taylor Report, would change the way stadiums, police and stewards operated in England. Though the changes that were brought about were a direct result of this inquiry, there was no justice for those that lost their lives on that fateful day for almost 30-years. After a successful online petition campaign, an independent panel was ordered to review more than 450,000 documents related to the Hillsborough tragedy. Most of the documents had never been seen before. The findings of the panel brought to light what most in Liverpool had known all along: Liverpool fans were not at fault for the deaths of the 96. A website has been established for the panel HERE. You may also read the report in its in entirety by downloading the PDF file Hillsborough Independent Panel Report. 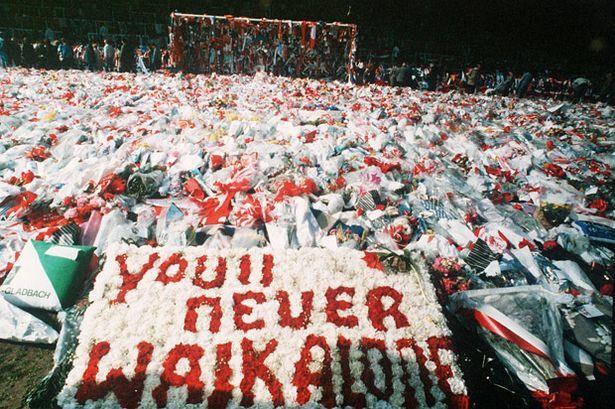 Building on the findings of the Independent Panel, a second inquest was brought forth into the death of the 96-fans which yielded an altogether different conclusion from the first. Armed with the evidence that was long missing, on April 26th 2016, the inquests concluded that they were not only unlawfully killed, but that match commander Ch Supt David Duckenfield was in breach of his care of duty and “responsible for manslaughter by gross negligence.” It took 27-years to tell us what we’ve known all along. Already exonerated of any wrong doing and finally shedding the lies that had been perpetuated since the tragedy, the families of the victims and the city of Liverpool as a whole may now finally find some comfort and a little solace after a brave fight.